I remember, as a kid, my grandfather talking about how everyone knew where they were and what they were doing on the “day that will live in infamy,” i.e. the attack on Pearl Harbor. And I also remember my dad talking about where he was the day Kennedy was shot in 1963. These moments of national crisis are crystalized in the memories of those who went through them. The closest I had come to such a moment in my own life had been the Challenger explosion in the 80’s, when I was a 5th grade student at Immaculate Conception School in Blytheville, AR. 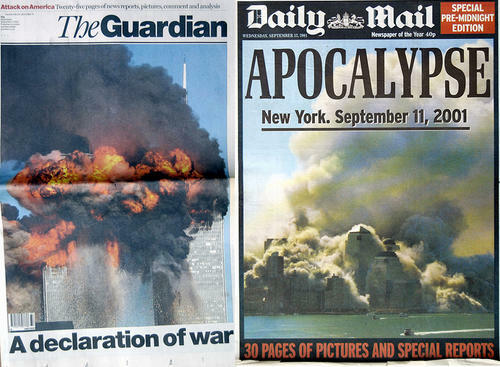 That all changed on 9/11/01. I had just started in the PhD program at the University of Missouri in Columbia, and I was settling in to a new town and getting to know a new stable of friends. This was the furthest I had lived away from home in my life, so I was already experiencing a feeling of dislocation and aprehension. Graduate study is daunting in and of itself. Years of study and work ahead even if you measure up, which 8 out of 10 graduate students fail to do. I literally did not yet have cable — the cable guy was scheduled to come in later in the week. I had spent a long night doing some reading and had planned on sleeping in the next day. So you can imagine my surprise and consternation when my roommate, the lacross coach at MU, woke me that morning and informed me that a plane had crashed into the World Trade Center. I descended from my room (a tiny room in a duplex on the north side of town…it was probably a little bit bigger than Harry’s room under the staircase on Privit Drive) to the main room downstairs to watch the NBC coverage (by way of antenna) of what I initally believed to have been a tragic accident. We were discussing how a plane could have accidentally veered into the WTC, and we speculated that some catastrophic failure in the plane’s guidance systems had occurred when I saw a glint of metal off to the side of the WTC. Looking back, it was as if time stopped. In my memory, the plane careening towards WTC 2 was moving in slow motion. It felt as if I could reach out and stop the inevitible from happening. It seemed as if that plane would never reach its horrifying destination. But of course, I could not stop it…and its plunge into that wall of glass and steel thundered home the reality of that moment. And even through the grainy reception on an old-school tube-based 20 inch TV, it was clear that the world had changed. As that plane, looking no bigger than a bird, blew through the building and we watched, dumbstruck, as the movie-esque fireball engulfed the World Trade Center…it was an emotional experience I have difficulty describing. Shock. Awe. Denial. Followed by fear and anger. Who had done this? Who would do this? How could this happen to us? That moment hammered home the undeniable fact that the untouchable and invoiable United States homeland was untouchable and invoiable no more. The rest of the day was a blur. The towers fell. We learned of the third plane and its destiny with the Pentagon. And initial reports indicated a fourth plane had gone down in Pennsylvania. I went to a local resturant to watch continuing coverage on cable news. On the way, I stopped at Wal-Mart and bought an American flag to hang out of the window of my car. Again it is tough to describe what I was feeling. That overwhelming sense of wanting to *do* something…but being completely impotent to do anything. Not to mention the uncertainty. Was this just the first blow in what was to be armageddon? When would the next attack come? Tonight? Tomorrow? A week from then? The movie Red Dawn, which postulated a Cold War era attack on our homeland by communists, had always seemed surreal. More unreal than science fiction. An attack like that couldn’t really happen. Not to us. And then it did. The world had changed. The following days were a deluge of terrible bits of news, each more depressing than the next, as reality began to set in. 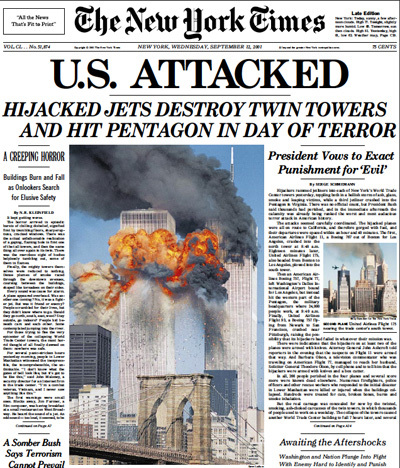 We learned that we had been attacked by Al Qaeda and that the attacks were percipitated by jihadists directed by Osama Bin Laden and a War on Terror would ensue. We knew the enemy. But we did not know what he could or would do next. Small sparkles of hope and joy in survivors found and heroism noted were overwhelmed by the absolute reality of the carnage and the number who had lost their lives. And I realized what it meant to live through an event like Pearl Harbor or the Kennedy assasination. To experience the gamut of emotions of a truly world-changing event. To be there when it all changed and would never be the same again. 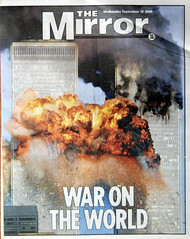 My story of 9-11 is but one of millions of simillar stories. We were there when the Towers fell. When the Pentagon was violated. When those heroes on Flight 93 proclaimed “Let’s Roll” and struck the only counter-blow against the terorists the West managed on that day. 9-11 changed my views on the importance of international affairs, on the state of national security, on the threats to our country, and on what must be done to protect it. 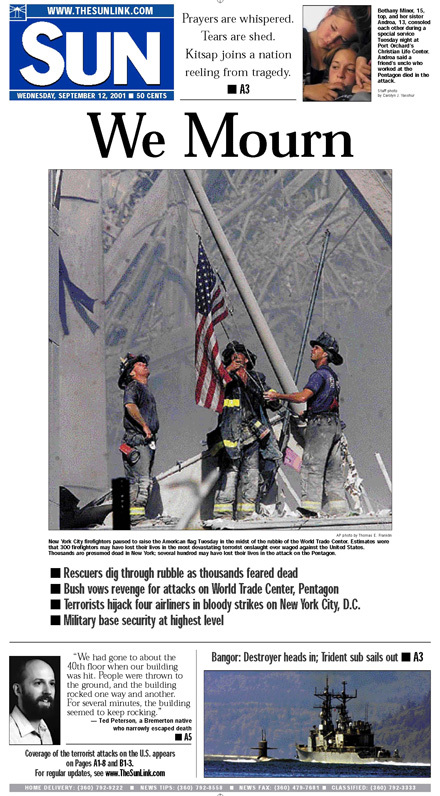 In many ways all of our politics, foreign and domestic, have been affected and continue to be affected by that day. The Chinese have a saying, a curse directed at your enemies: “May you live in interesting times.” In other words, may you live in a time of uncertainty, upheveal, war, and death. 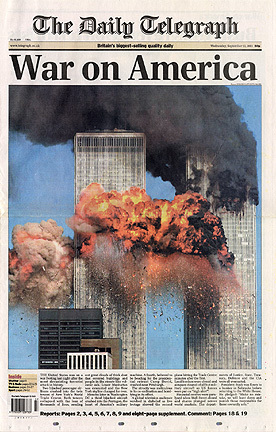 9-11 was the first moment of the “interesting times” of the War on Terror. A day that will live in infamy. A day I lived through, just ten short years ago, on a beautiful Tuesday morning in September. Should we celebrate OBL’s death? That question has been raised in the wake of the spontaneous celebration that occured in response to OBL’s demise. I certainly understand those of faith who hesitate to cheer the end of any life, and I understand those who are uneasy with the ‘party’ atmosphere that emereged on Sunday. I celebrate the end to his reign of destruction. I celebrate the justice obtained for his innocent victims. I celebrate the unparalleled courage of our military forces. I celebrate the awesome skill Seal Team 6 displayed in taking OBL down. I celebrate the fact they gave him an opportunity to surrender. I celebrate the fact they minimized civilian casulties and collateral damage. I celebrate Presidents Bush and Obama for their dogged pursuit of this monster. I celebrate the intelligence personel who worked for years, unheraled, to bring him down. I celebrate the countless innocents, Muslim and Christian, who will now not be victims of his murderous terrorism. I celebrate the untold number of young pople who won’t be poisoned by his evil ideology. I celebrate the fact OBL had to face his Maker and account for his actions in this life on Sunday. Awesome. Osama Bin Laden is dead. OBL = room temperature. Bin Laden was killed by an American bomb, reportedly, a week ago [DG: See Updates Below]. They waited to conduct DNA tests to confirm before reporting. UPDATE: As I noted on Twitter, early reports (as they usually do) have turned out to be inacurrate. It happened today, not last week. It was a covert ground attack by elite special forces of the US military. Best info at this point, per Obama’s annoucement: The US developed intelligence locating Bin Laden in a compound near Islamabad. Obama gave the go, and US special forces attacked the compound…delivering special forces into the compound through 4 helicopters (one of which crashed). No US troops were injured. In the firefight, 3 combatants were killed, including Osama Bin Laden and, reportedly, his eldest son. The US has Bin Laden’s body in custody and, apparently, have confirmed his identity through DNA tests. UPDATE: Here is a transcript of President Obama’s address confirming the death of Osama Bin Laden at the hands of U.S. forces. UPDATE: Assuming the details I reported above are true, the second day story is the implications this has for the Pakistani-US relationship. Bin Laden wasn’t holed up in some cave in the outlying tribal areas. He was in a massive compound, apparently constructed just for him, in the open and right next door to the Pakistani capitol. According to President Obama, Pakistan was not consulted with on the assault nor where they informed of it beforehand. A lot of questions are going to be asked. UPDATE: FOX News reporting Navy Seals were involved in the operation (no surprise there). There is celebrating in Times Square and outside of the White House. UPDATE: Cool. This IT guy apparently and unwittingly live-blogged the assault on Twitter. Earlier this evening, President Obama called to inform me that American forces killed Osama bin Laden, the leader of the al Qaeda network that attacked America on September 11, 2001. I congratulated him and the men and women of our military and intelligence communities who devoted their lives to this mission. They have our everlasting gratitude. This momentous achievement marks a victory for America, for people who seek peace around the world, and for all those who lost loved ones on September 11, 2001. The fight against terror goes on, but tonight America has sent an unmistakable message: No matter how long it takes, justice will be done. Didn’t happen on Bush’s watch. But there’s no question he deserves credit tonight along with President Obama. Bush paved the way and Obama took up the baton (or should I say he layed up the Bush bounce pass, given Obama’s love of B-Ball?). Well done, both presidents. UPDATE: More information coming in. Apparently Bin Laden was fairly brazen here. This compound he was in stuck out like a sore thumb. A million dollar compound in that area? With that much security? US got wind of his possible location through intel obtained from detainees. 2 brothers owned compound – were part of the Bin Laden courier group. Evidently OBL had more operational control over AQ than was previously thought. Another tidbit – reportedly the Seals gave OBL a chance to surrender. He declined and they obliged him. The U.S. had been monitoring the compound in Abbottabad for months after receiving a tip in August that Bin Laden might be seeking shelter there. He had long been said to be in the mountainous region along the Afghanistan, Pakistan border, hiding in a cave as the U.S. sought to kill him with drone strikes from above. Instead, he was in a house eight times larger than its neighbors, with a seven-foot wall and valued at $1 million. The house had no phone of television and the residents burned their trash. The house had high windows and few points of access, and U.S. officials concluded it had been built to hide someone. According to U.S. officials, two U.S. helicopters swept into the compound at 1:30 and 2:00 a.m. Sunday morning. Twenty to 25 U.S. Navy Seals under the command of the Joint Special Operations Command in cooperation with the CIA stormed the compound and engaged Bin Laden and his men in a firefight, killed Bin Laden and all those with him. UPDATE: Some reports suggest OBL has already been buried at sea. I tend to doubt that’s happened yet…more likely that represents current US plans [SEE Update below – DG]. No desire to create a shrine, of course. The closet historical parallel would be the body of Hitler. Which was reportedly taken by the Soviets, hidden for a number of years in a secret grave…and eventually destroyed and scattered to points unkown. UPDATE: Pic of the Year? UPDATE: Confirmed. OBL’s body has been buried at sea. Reportedly Muslim burial rites were followed. Muslim tradition is that a funeral must occur w/n 24 hours of death, so that undoubtedly played into the decision to do the burial immediately. The problem will be in squelching rumors that this was all a hoax. The body, of course, was indisputable evidence it was not. Will the evidence the US collected b/f the burial be enough to stave off conspiracy theories? Given the resistance to compelling evidence most conspiracy theories involve, I doubt it.